For Jim Braunscheidel, owner of Scoville Brown Cooperative, his art is architectural salvage, saving a piece of the old and turning it into something new. The building that houses the Scoville Brown Warehouse in Wellsville, New York, is an example of this. From the 1800s until the 1940s, it was a bustling grocery wholesaler. 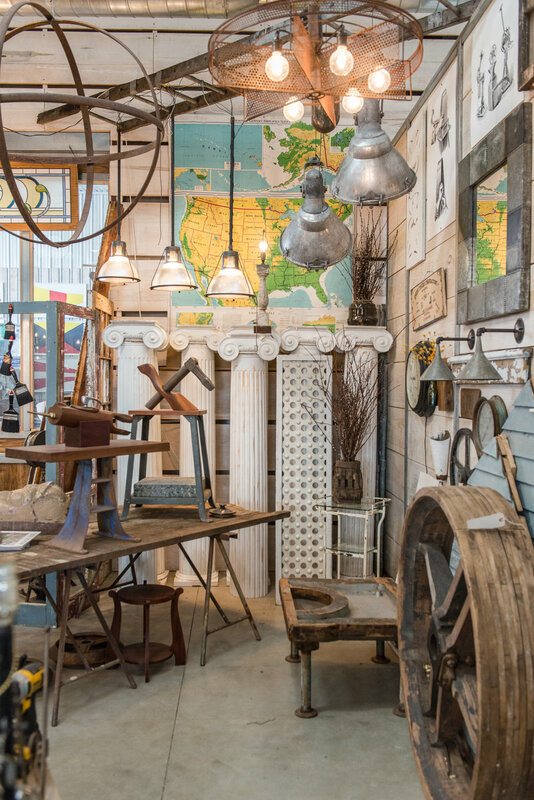 Jim has given it new life with three floors of antiques, architectural finds and artwork. The “Hearts Delight” slogan is still visible on the north side of the brick interior, and it’s evident from talking to Jim that this is his heart’s delight. “Just to walk in, to get your hands on something original, something untouched, that’s what inspires me,” he says. On these jobs, the reality is, if he didn’t get his hands on it, it would all be thrown away, beautiful woodwork, ornate architectural detail, discarded forever. He not only sees the value in saving these artifacts but also in repurposing them. “These works are my artistic expression and interpretation of where history, creativity and functionality meet,” he says. What Jim brings to Market Hill is a variety of antiques and architectural finds. Meet Jim at Market Hill, and be inspired by Scoville Brown Cooperative. For more information, visit, scovillebrown.com.